Mrs. Falk’s experience in Catholic education began with her parents’ decision to send her to St. Genevieve Catholic School only to become a teacher there and later in her career the school principal. She is excited to be here at Holy Name of Jesus Catholic School, her new home. Mrs. Falk’s Bachelor’s Degree was conferred by Saint Francis University in Loretto, Pennsylvania with a Major in Political Science. Later she went on to obtain her Florida Teacher Certificate and then continued her education at the University of North Florida that granting her a Masters in Educational Leadership. Amazed at the work of God Our Father, through the Holy Spirit, Mrs. Falk was approached by her former elementary school principal, Sister Eleanor, to be a middle school math and technology teacher. Since no one would think of saying no to sweet Sister Eleanor, this “yes” would be the beginning of Mrs. Falk’s career in education. Over the span of her career, Mrs. Falk has worked for the Archdiocese of Newark, the Diocese of St. Augustine, and now the Diocese of Orlando. 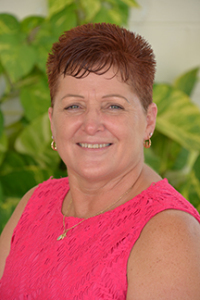 She has served as a teacher for all grades and subject areas for Pre-K 3 through 8th grade, as a Principal, and as the Assistant Superintendent of Schools for the Diocese of St. Augustine. Mrs. Falk has been a member of curriculum and standardized testing committees for the Florida Catholic Conference, interim principal and Diocesan representative, curriculum coordinator, professional development coordinator, as well as a team member for accreditation visits serving with the Florida Catholic Conference and for the Middle States Association Commission on Elementary Schools.